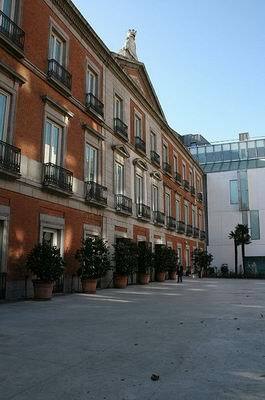 Once the Madrid residence of the Duke of Villahermosa, this typically neoclassical building on three floors is nowadays home to the art collections of the Thyssen-Bornemisza Museum. Its angular façade is typical of the 18th and 19th century's neoclassical architecture, though modern extensions were added in 2004. In the 1980s it had been used as an exhibition hall for the Prado Museum. It was originally built by Antonio López de Aguado for María Pignatelli y Gonzaga, the Duke of Villahermosa's wife, and the couple used the building as their residence in the capital in the early 19th century. During this time, the house was a focal point for social events, and Franz Liszt is said to have played at a soirée given there by the Duke and Duchess. In the 20th century, it was turned into office space for a bank, but was later bought by the State for use as a museum. Interestingly, during its heyday, it is where the Duke of Angouleme, exiled heir to the French throne, came to stay when he was asked by the Spanish King Fernando VII to help him lead an attack on liberal factions in 1823. The French army he brought with him was known as the Hundred Thousand Sons of St. Louis. The attacks successfully restored an absolute monarchy in Spain, and the Duke of Angouleme went on to become the last Dauphin of France when his father became Charles X in 1824. He himself has the dubious reputation of being the world's shortest reigning king, when he became King Louis XIX for twenty minutes only in 1830, before he abdicated in favour of his nephew. The main façade of the building faces the gardens, and still bears both the family crest and the name of the Duchess who commissioned the building, Maria Pilar Azlor de Aragón y Guillamas. The building's original architect, Antonio López de Aguado, was trained in Spain, Italy and France, and most of his important work was done in Madrid, including the Puerta de Toledo and the Teatro Real. His life spanned the typically neoclassical period of architecture in Europe, and he died in 1831. The building is situated in the Paseo del Prado, and is a short walk from the Prado Museum and the Buen Retiro Park in one direction, and the Plaza Cibeles in the other. The nearest Metro stations are Retiro and Banco de España.